I received the following email information from Benjamin Fulford and am publishing it with his permission. There is much I cannot tell. I met David Rockefeller just before he was due to meet the Emperor. He was summoned. Something big is happening. It seems G.T. Fulford is an honest-to-God genuine ghost. (Ghosts have appeared to, and worked through, relatives and descendants throughout history. -ed) The reason I met him (Rockefeller) is that I sent a letter from G.T. to him. I believe the matrix is about to collapse and the world is going to get much, much better. The fact that I was able to call him (David Rockefeller) directly (without going through middlemen), and knew he was in Tokyo for what was supposed to have been a secret visit, may have spooked him a bit. It is clear the Asian secret society has begun to move. The dollar is still dropping. The US Air Force has suspended all flights of F15s. Japan's politics are in turmoil. The post-war regime is ending. I have attached G.T. 's letters to David. My very powerful subjective experience was that the letters were dictated to me by G.T. Fulford. I have never believed in ghosts. However, I have had visions recently (without using any drugs) so powerful and so unusual, that I am pretty sure G.T. is really a ghost. Impossible memories are also coming back to me (like being frozen and hungry on a boat in the St. Laurence river in my early days or like my love for Eleanora - the lady I knew of as my great-aunt Eleanor). Please also note that William Lyon Mackenzie King, who was Prime Minister of Canada for over 20 years, wrote in his diaries that he consulted with ghosts to decide how to run the country. Mackenzie King's seances were often held at the Fulford home. My Great Grandmother introduced him (King) to spirituality. According to my Grandmother, he regularly consulted with the ghost of G.T. Fulford. David Rockefeller told me that Mackenzie King was his father's best friend. These are historical facts. I continue to check and, as far as I can tell, I still have full sanity. Note - Here are three letters purportedly dictated to Benjamin Fulford from his late Great Grandfather G.T. 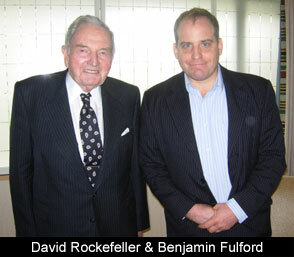 Fulford to David Rockefeller. Your picture was in the paper yesterday. I am worried about you. You look like you have at most six months left. You have to think about your legacy. I knew your Grandfather J.D. He was obsessed with his own mortality. He often said to me "it is not fair, I have everything, why do I have to die?" He decided to either provoke God into making an appearance or else create God himself. After our last meeting, when he told me of his plans, I was horrified beyond belief. I knew there had to be a God. I determined to stop him. He had me killed. As I lay dying, I was so worried about the future of the human race, I became a ghost. I have now returned to finish job of saving the planet. You and your people finally provoked God enough to force It (God is gender neutral) to make an appearance. The planet is like a giant egg that is about to hatch. Humanity is about to expand into billions and trillions of different species spreading throughout the universe and into different fractal dimensions. Many will be immortal by your standards. One more thing, there really is a Heaven. I have been there. You will be able to go there so long as you take good care of your legacy. You will be known as the Greatest of the Mortals, the man who presided over the dawn of the age of immortals. Congratulations. As I mentioned in my last letter, I have been to Heaven. I suppose you may be curious as to what it is like. I will tell you some of what I remember. Heaven is like the ultimate virtual reality. Whatever you imagine is real. You will also be free from the horrendous loneliness of the mortal who is locked inside his own head. You will be able to join with other minds or merge into the Tao or the Godhead. The Tao is the dynamic part of the universe. The Godhead is like an infinite ocean of mind. Heaven exists in the Godhead. Earth is in the Tao. The Tao generates the Godhead. My own last memory of heaven is that I was a giant whale-like creature swimming through a vivid green ocean analogue. I was experiencing heavenly pleasures which, given your current state of development, make earthly pleasure almost seem like nothing. Suddenly, I appeared in a human configuration in a small blue room. The room was Spartan and not geometrically shaped. I was told I had a job to do. I was to go to the planet Earth in reality C-558 (sorry, I made up the C-558 part as such a human system of enumeration and cataloguing would make no sense in an ocean of infinite realities). I was given a temporary memory wipe and my memories are only now returning to me. You may remember I referred to "your definition of immortality." What I meant was that in addition to your concept of lineal immortality there many other types. One example could be called point immortality. Imagine a drop of water that merges into a river and then an ocean. The drop as a singular entity will cease to be. However, it will reappear in the same configuration an infinite amount of times. Sometimes it will be identical, sometimes only similar. In a similar way, your soul too could merge into an ocean of souls and vanish as a single ego only to reappear again and again. Any choice to merge would be yours to make. Your memory will remain intact, but in the same manner in which you forgot what you ate for lunch exactly 3 years ago, over the aeons much will fade away from lack of use. Weaker people, who might be tempted to commit suicide in order to enter heaven, will simply melt like a snowflake falling in the sea. I was also able to confront God with some of my doubts. Why, for example, does an 8-day old child have to die of starvation in an African refugee camp? What happened to all the creatures that have gone extinct over the ages? The answer I received is that just like there is matter and anti- matter, there is life and anti-life. They are like Ying and Yang or the two hemispheres of a brain. Destruction and creation are different parts of the same dynamic process. As living creatures, we must fight to increase both and our own specific life energy and all life energy. By doing so we will be generating both life and anti- life, replenishing the Yin and the Yang. God also said the universe is fractal. So, just like not all turtle eggs hatch and send new turtles into the sea, so it is with planets as a whole and the creatures in them. Much of what you can see in a pond, will be similar to what you would see in a pond of universes. It is up to you to make sure you succeed. God does not like to babysit. Is there an end to it all? I asked. "So far it just keeps getting infinitely better forever but, we will let you know if we find out anything different," came the answer. There is much I saw that I cannot describe but perhaps, at some future date, I could illustrate. In any case, as these memories and visions came back to me, my entire nervous system was so flooded with energy that I was worried it would overload. I do not believe these visions to be the product of an over- active imagination. Here is a humble suggestion. We would like to see your Armageddon. It would be a fitting way to announce a fresh start for the planet Earth. Please, turn on your hologram machines, bring out your flying saucers, fill your screens with your best computer graphics. We want to see the greatest show the planet has ever seen. But please, no hurting people and no vandalism. Although perhaps it might me neat to watch you zap an Antarctic mountain or two with your earthquake machine and any other toys you may have stashed away. We want to have a party such has never happened before. After the party is over, how about hosting a Global pow-wow to decide how to carry out an intensive, unprecedented, three-year campaign to eliminate the 5 curses of humanity: war, poverty, environmental destruction, ignorance and disease. At the end of those three years, every child on earth should have a full stomach and a full mind. It would also be a wonderful thing if we as a species could divert as many resources as possible to the task of ensuring immortality for all humans on the planet. Of course we would need to enhance our intelligence and release all the hidden technology that could benefit the species if we are to be able to take care of all these new immortals. Once this accomplished, humanity will be able to reach for the stars and beyond in ways we cannot even imagine.